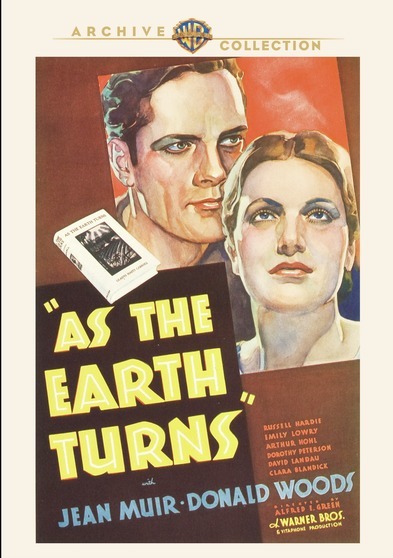 AS THE EARTH TURNS (1934) is a fine filming of the Pulitzer Prize nominated book by Gladys Hasty Carroll. The movie has just been released on DVD by the Warner Archive. I first read Carroll's novel about Maine farmers thanks to my well-stocked high school library. I was thrilled when years later I tracked down a used copy -- not always easy in pre-Internet days -- and could reread it whenever I wanted. That said, it's been many years since I last opened the book's pages, and my memories are faded enough I'm not certain just how thorough an adaptation Ernest Pascal's screenplay is; indeed, my only complaint about this 73-minute film is that it's too short! With so many interesting characters, this should have given them more time and been a 90-minute movie. Well, seeing the movie is motivating me to revisit the book at long last, not least so I can see what was dropped from the film! AS THE EARTH TURNS tells the story of two farming families, the Shaws and the Janowskis. Mark Shaw (wonderful David Landau) is a hard-working, successful farmer with a large family. Sensible daughter Jen (an excellent Jean Muir) is the loving center of the Shaw family, capably caring for everyone in her midst, including a little brother and sister (Wally Albright and Dorothy Gray). Her brother Ollie (William Janney) is only home on breaks from college, while brother Ed (Russell Hardie) soon marries Margaret (Emily Lowry) and moves to his own farm. 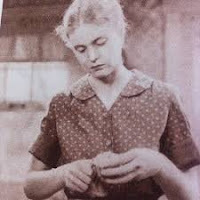 The Shaw family is rounded out by Mark's second wife, the ever-complaining Cora (Clara Blandick), and her manipulative daughter Doris (Dorothy Appleby), who is determined to return to the big city. (Doris's name is one novel-to-film change I noted!) 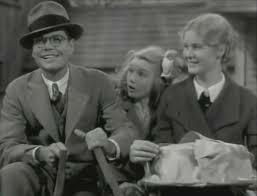 There's also Mark's ne'er-do-well brother George (Arthur Hohl) who is married to Margaret's sister Mil (Dorothy Peterson); Mil struggles to feed their four little ones while George will do anything to get out of work. The Janowski family are Polish immigrants who have relocated from Boston to move into a barn down the road, but only oldest son Stan (Donald Woods) seems made for farm life. Stan and Jen fall in love, but Jen is cautious, having seen too many around her giving up on farming and/or unhappily married; she loves the farming life and wants to be certain Stan is committed to it, as well as her, for keeps. Although the cast is huge, the film does a good job quickly establishing distinct characters; early in the film, as it shifts back and forth introducing the families, we see the pages of the novel turning with each scene change, a convention also used by the studio the following year when filming the book OIL FOR THE LAMPS OF CHINA (1935). Despite (because of?) the exteriors being filmed almost entirely on soundstages, the movie quickly and effectively creates a distinct, absorbing world. Muir is particularly excellent as the reticent Jen, who has the patience of a saint with those around her who don't always deserve it...and deep down, stronger feelings which she is slow to share. The same year this film was released Muir also starred with George Brent in a favorite film of mine, the charming DESIRABLE (1934); I also enjoyed her as Helena in A MIDSUMMER NIGHT'S DREAM (1935) at this year's TCM Classic Film Festival. Jen seems to be cut from the same cloth as her father Mark (Landau), who works hard while seemingly ignoring his wife's constant put-downs; he also helps his undeserving brother because he's not going to let George's children go hungry. 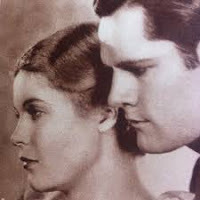 Landau's too-early passing in 1935, at the age of 56, was a sad thing for the movies, as he was such a fine, fine actor. His last film was John Ford's JUDGE PRIEST (1934). 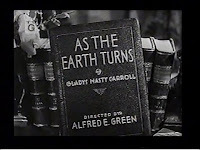 All in all, while AS THE EARTH TURNS could have used at least several more minutes to deepen its plotlines and characterizations, it does a really fine job given the limitations of time and budget. I enjoyed it very much. 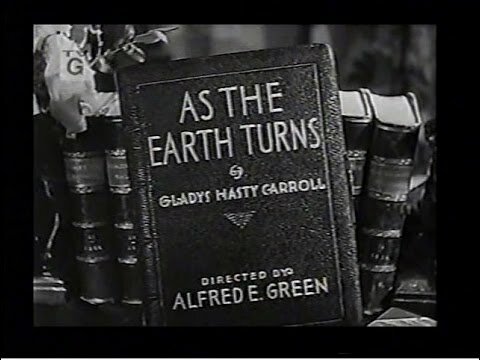 The movie was directed by Alfred E. Green and filmed by Byron Haskin. The supporting cast includes Marilyn Knowlden, Sarah Padden, Egon Brecher, David Durand, and Cora Sue Collins as Stan's little sister. What fun to see her in this, having just seen her in person at the Cinecon Festival a few days ago! Stills from this film are curiously difficult to track down, hence the relatively poor quality of those shared here.